Kiruba Krishnaswamy, a recent addition to the University of Missouri College of Agriculture, Food and Natural Resources and the College of Engineering, focuses on preventing food loss and extracting useful resources from food waste (food security) and food fortification with micronutrients to prevent “hidden hunger” (nutrition security) using food process engineering and employing new tools like green nanotechnology. Like many people, Kiruba Krishnaswamy loves to eat. She even calls herself a foodie, and she loves to explore the cuisines of different cultures. Despite her lifelong love of food, Krishnaswamy, an assistant professor of biological engineering, had never heard of food engineering before she went to college, but she was intrigued by it. Krishnaswamy intends to spend the next five to 10 years at MU building out a zero hunger … Expand ▸Krishnaswamy intends to spend the next five to 10 years at MU building out a zero hunger inter-disciplinary research team to grapple with global challenges. Thus, her research group, named FEAST (Food Engineering and Sustainable Technologies), will consist of both food scientists and engineers from CAFNR and the COE. These groups speak different languages, but Krishnaswamy speaks both, and so is uniquely positioned to bring these disciplines together and harness their collective powers. One reason for her interest was because the discipline stood at the intersection of the natural world and technology, which was just what she was looking for. What clinched it, however, was the fact that pursuing a degree in food engineering would also afford her the opportunity to visit and intern at well-known food and beverage manufacturers, such as Cadbury, PepsiCo, Nestle and others. She reasoned that these field trips would give her plenty of chances to not only learn about food engineering in an industrial setting, but also taste samples of chocolate, cookies, biscuits, candy, cakes, fizzy drinks, etc. It was later in her college career that the real impact of her work became apparent. Having great mentors and the opportunity to work on international projects addressing food and nutrition security in India and Canada provided her with a new perspective on how engineering could be used to address pressing global challenges. Food security problems in India are well known, but nutritional security is a challenge as well. Krishnaswamy, a recent addition to the University of Missouri College of Agriculture, Food and Natural Resources (CAFNR) and the College of Engineering (COE), focuses on preventing food loss and extracting useful resources from food waste (food security) and food fortification with micronutrients to prevent “hidden hunger” (nutrition security) using food process engineering and employing new tools like green nanotechnology. The visible kind of hunger, where people simply don’t get enough to eat on a day-by-day basis, affects some 820 million people worldwide. In contrast, hidden hunger is insidious and affects more than 2 billion people, nearly a third of the world’s population. Hidden hunger is hidden because, on the surface, people are well-fed. They get enough food to survive, but what they don’t get are the essential vitamins and minerals, like folic acid, vitamin B12 and iron, that are crucial for development. Hidden hunger is found in both developed and emerging economies where the excess of calories and lack of nutrients reveals the double burden of hidden hunger: malnutrition and obesity. Krishnaswamy remembers an interaction she had with a midwife in Kenya. But fortifying food with vital nutrients isn’t as simple as just sprinkling them on. For instance, salt is itself a vital nutrient and most salt is iodized, i.e., fortified with iodine, which prevents swelling of the thyroid gland in the throat, commonly called a goiter. However, if you wanted to fortify salt with more than just iodine, say, iron, you have to keep the chemicals from coming into direct contact with each other. This is because iron and iodine, when mixed, interact with each other (i.e., iron in ferrous form becomes ferric and sublimation of iodine occurs) affecting the bioavailability of both the micronutrients in human body. For these nutrients to actually nourish a person, they have to be encapsulated in tiny shells as little as a few billionths of a meter in diameter. These tiny capsules act as a barrier to keep the micronutrients from reacting with each other and protect them from the external environment, but dissolve when they are ingested. At present, Krishnaswamy’s group is working to micro- and nano-encapsulate iron, folic acid and vitamin B12 for food fortification. According to Krishnaswamy, food fortification projects like these are the best way of fighting micronutrient malnutrition on a large scale. Direct intervention in the form of a doctor or even a vitamin pill can be expensive, and it’s sometimes hard to reach so many people at once with doctors or pills. With fortification, micronutrients can easily be added to foods that many people are going to eat and enjoy anyway — and it is possible to reach the poorest of the poor through food. The concept seems relatively simple, but there are challenging research questions that need to be addressed during every step of processing to prevent the interactions among multiple micronutrients and the foods they are meant to fortify. Krishnaswamy came on-board just after the United Nations Sustainable Development Goals (SDGs) were … Expand ▸Krishnaswamy came on-board just after the United Nations Sustainable Development Goals (SDGs) were announced in 2016. In addition to having a larger context for her research, this gave her the opportunity to incorporate the UN’s “Sustainable Development Goal 2: Zero Hunger” by developing a new courses that aligns with the Deaton Scholars Program and make students aware of the potential impact of interdisciplinary approach towards global challenges. Krishnaswamy spearheaded the effort for MU to become an official member of the United Nations Academic Impact (UNAI) and organized the first UN Sustainable Development Goals workshop at MU. Photo courtesy of Audrey Roloff. About 50 percent of women and 70 percent of children in India are anemic — the highest percentage recorded in the world. Before coming to MU, Krishnaswamy was actively involved in technical research and scale-up technology transfer on double fortification of salt with iron and iodine. This joint undertaking by the Indian government, Canadian International Development Agency, TATA Trust, Bill and Melinda Gates Foundation and the University of Toronto, Canada, is now reaching 60 million people in India, and there are plans to further expand the project to reach millions more in India and Africa. One of her projects involves using the waste from growing and harvesting grapes to create gold nanoparticles. (Nanoparticles are engineered materials that are less than 100 nanometers in size. The average human hair is about 80,000 nanometers wide. When you’re talking single nanometers, you’ve nearly entered the world of atoms.) According to Krishnaswamy, grape stems, seeds and stalks have a unique chemistry that enables them to collect, stabilize and encapsulate gold nanoparticles, which are often used in cancer screenings and treatments. The common way of producing them uses toxic chemicals. Grape waste produces gold nanoparticles in an eco-friendly way and uses only water. But gold nanoparticles are not the only thing Krishnaswamy is looking to harvest from food waste; she’s looking into recovering food from food waste as well. One of the byproducts of making Greek yogurt is acid whey. Considered useless by food manufacturers, acid whey is typically poured down the drain or sold to farmers to use as fertilizer. The only problem with that is that acid whey is full of nutrients that humans—and microorganisms—can put to good use. The runoff from fields can cause blooms of algae that are harmful to fish and other wildlife. Instead of harming life, Krishnaswamy would like to see acid whey be used to nurture it by adding the valuable compounds it contains as food ingredients. Krishnaswamy recently received industry funding from Black & Veatch for this project. The chemistry of this is tricky, and it will take some time to learn how to separate micronutrients from acid whey at scale. Krishnaswamy intends to spend the next five to 10 years at MU building out a zero hunger inter-disciplinary research team to grapple with these global challenges. Thus, her research group, named FEAST (Food Engineering and Sustainable Technologies), will consist of both food scientists and engineers from CAFNR and the COE. These groups speak different languages, but Krishnaswamy speaks both, and so is uniquely positioned to bring these disciplines together and harness their collective powers. Krishnaswamy joined MU in April 2018 as a part of the “Pillars of Pursuit” cluster hire under Sustainability in FEWSed (Food, Energy, Water, Smart Cities). Krishnaswamy says she came to MU because very few universities around the world have sustainable food process engineering research programs, so it was a good fit. It was also perfect timing. She came on-board just after the United Nations Sustainable Development Goals (SDGs) were announced in 2016. 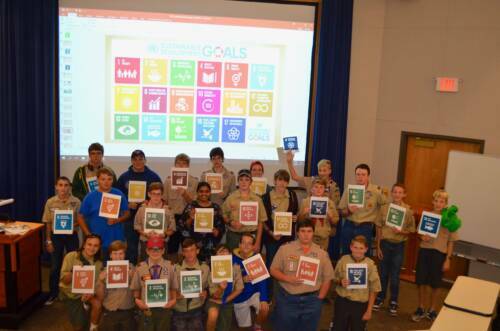 In addition to having a larger context for her research, this gave her the opportunity to incorporate the UN’s “Sustainable Development Goal 2: Zero Hunger” into the courses she teaches and make her students aware of the potential impact of their studies. Krishnaswamy was inducted into Institute of Food Technologists (IFT) Emerging Leaders Network 2018 and serves as liaison to IFT’s foundation Feeding Tomorrow. She spearheaded the effort for MU to become an official member of the United Nations Academic Impact (UNAI) and organized the first UN Sustainable Development Goals workshop at MU. 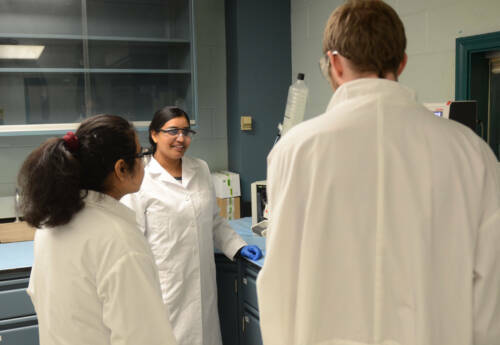 Krishnaswamy believes that diversity and interdisciplinary research is celebrated at MU, a strength that will enable her team to become global leaders in food sustainability research.